Wedges are very useful tools for human life, but here we are talking about the wedge like formation in price chart of financial instruments. As the name suggests, breakout of a bearish or rising wedge suggests an upcoming bearish trend and hence a short entry signal. 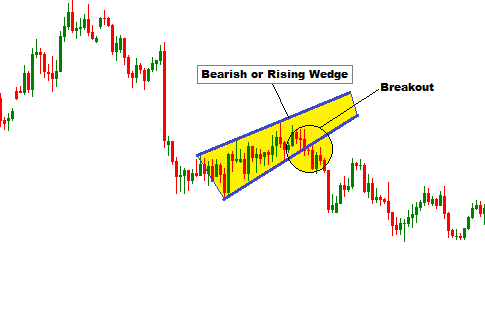 On the practical price chart, wedge pattern are formed as illustrated in below. A rising or bearish wedge has two upward slopping lines coming closer gradually. 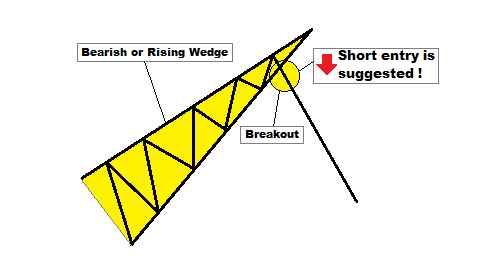 The breakout of the lower line of a rising wedge pattern is considered as the breakout of the pattern. Breakout of the pattern is done by the price. 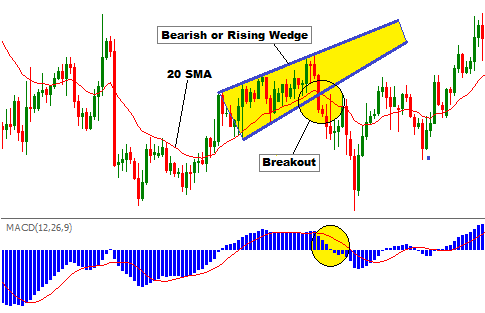 Generally, a short entry signal is suggested when the price breaks out the rising wedge pattern, but every breakouts may not be that much profitable. That is why traders need to verify whether the breakout is reliable or not. Two commonly applied conditions are that a reliable breakout takes place when a new candle open out of the area and the volume increases while the breakout takes place. I did not find the aforementioned conditions effective to identify a reliable breakout. To find the reliable breakouts of the rising or bearish wedge chart pattern, I insert 20 period simple moving average and MACD histograms indicator. You can apply any type of moving average, but the time period should be 20 for the moving average. A reliable breakout of the rising wedge chart pattern is found, if the price moves below the 20 period moving average and the MACD histograms turn into negative territory(most effective) or the histograms become shorter in the positive territory or the histograms become longer in the negative territory, while the breakout is taking place . Dear Traders, hope you enjoyed my post. If you have any question regarding this post, you can drop it into the comment section below. I generally response to your comments within 24 hours.